Shoulder muscle exercises. Weight lifting exercises for the traps and shoulders. Shoulder muscle workouts. Weight lifting exercises for the muscles of the shoulder. Step 1. Use a bench that positions you in an upright sitting position. Sit up straight, with both feet planted on the ground. Step 2. Face palms forward away from face, and begin to lift the dumbbell directly over-head with your elbows lined up with your shoulder, or slightly behind. Step 3. Stop the movement over-head, and do not lock your elbows. The movement should be just shy of a locking position. Fully contract and focus on the traps and shoulders.. Step 4. Begin to lower the weight back in to the starting position once again. Step 1. Sit or stand, using a very light weight dumbbell. Hold the weight at your side with your palms facing your outer thigh. Step 2. 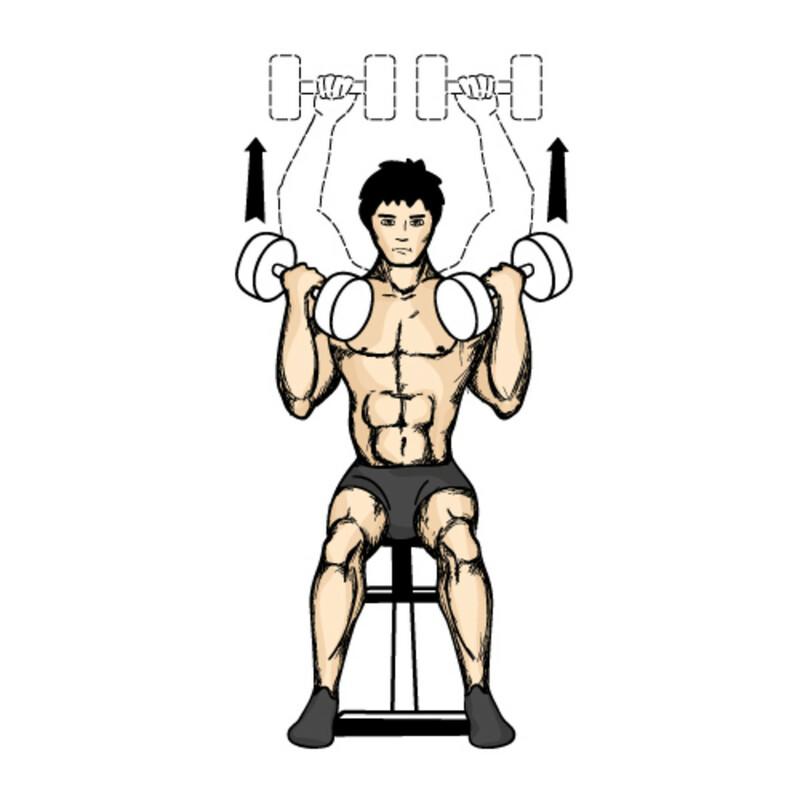 Proceed to lift the dumbbell slowly with your arms elongated to each side, or with just a slight bend in the arm. Lift the weight until you've reached the point above your shoulder. Step 3. Once you've gotten the weight all the way up, begin to twist the wrist so that the thumbs point downward, and the pinkie faces the ceiling. Like pouring a glass of lemonade. Step 4. At this point you should really feel it in the outer shoulder muscle. Lower the weight slowly back in to starting position. Step 1. Use a barbell, or an EZ curling bar. Hold the bar directly in front of your body, palms facing your leg, with a hand position of anywhere between 4 to 8 inches apart from one another, depending on what feels the best. Step 3. Then proceed to lower the weight steadily, and fully under control. Step 4. Don't use momentum to do this exercise. Slow and steady is the key to this movement. Step 1. Get in the position that you did with the dumbbell press. But this time, hold the weight up with your palms facing yourself. Step 2. Begin to lift the weight up over your head, twisting the wrist until your palms are facing away from your body. By the time you've gotten the weight all the way to the the top, your palms should be facing the complete opposite direction that they were facing at the beginning of the movement. Step 3. Lower the weight back down, twist the wrist back in to the starting position. The movement will look similar to a shoulder press moving into what appears as a bicep dumbbell curling position. Step 1. From a standing position, hold a barbell across the top of the chest. Step 2. Hoist the weight up over head, and bring back down in to the starting position. Step 3. For this exercise, feel free to use the lower part of your body to help hoist the weight up, when you're at the point where it feels as if you cannot do anymore. From: Shoulder Muscle. Back To: Weight Lifting Exercises. Back To: Muscle Building Home.